Deltares has a unique facility for geophysics that consists of wide range of technologies for collecting data about the subsurface on land and at sea, but also about the seabed. Geophysics comprises the non-destructive on-site measuring and monitoring technologies used to study the subsurface and the surface. The technologies exploit contrasts in the physical properties of the subsurface, which show the differences in lithology, hydrology, composition and density, but also in man-made structures and infrastructure. Deltares has a range of geophysical technologies that can be used to describe the subsurface or to localise specific properties. Uniquely, these technologies can be used in tailored ways for data acquisition and for experiments. A number of technologies can also be used to monitor processes over time. The facilities include different categories of equipment. Electromagnetic fields (EM-31, ground radar). All measurements can be entered to within centimetre tolerances using our precision GPS system. As well as using our own measurement equipment, we team up with other parties or design customised solutions. The basic philosophy is to examine each request individually to see which combination of technologies and knowledge will deliver the best result for the particular project. This can sometimes require creative solutions so that technologies may be adapted, devised, leased or purchased for a given project. Field observations, and geological and geohydrological knowledge, always play an important role in the integration of all measurements, observations and knowledge. Our goal is to provide a made-to-measure answer. The technologies are used on behalf of public and semi-public bodies, research institutes, contractors, mining and water extraction, project developers and consultancies. The questions can be broken down into four categories. Charting – We establish and chart the subsurface composition (geology), and local geotechnical properties; layer thicknesses and layer transitions; trenches and ‘the’ fresh/salt transition. Interpretation support – The geophysical technologies are often used to link point observations and to place them in a 2D, 3D or 4D context. In that way, the spatial interpretation of the point observations (bore samples/CPTs, water samples, hydraulic heads etc.) becomes possible or more reliable. Detection and localisation – We use these technologies to identify faults, hollows, leaks, boils, pollution and natural or man-made obstacles in the subsurface. The technologies can also be used as support for underwater archaeology and localising wrecks, cables and pipelines. 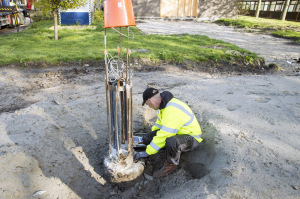 Design and construction – Prior geophysical investigations for construction projects can help to produce a sound design and mitigate potential risks. This approach can be used, for example, for the construction of aquifer thermal energy systems, in soil remediation, or for large structures such as wind farms (on land or at sea) and industrial complexes.